Vestil® Spring-Loaded Safety Gates Can Be Mounted From The Left Or Right. Universal Swing Gate Is Used For Indoor And Outdoor Applications Including Commercial, Industrial, Security, And More. Universal swing gate is made of aluminum and steel for long lasting durability and dependability. Unit provides barricade protection and security for garages, parking lots, hospitals, and more. Gate adjustability and universal mounting system provides swing directional control for application and location versatility. Malbec system allows ergonomic field tension adjustability accommodating environmental and safety requirements. Powder coat finish ensures corrosion resistance for low maintenance. Assembles and installs easily. 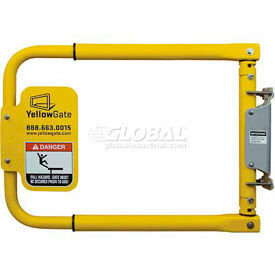 Styles include Yellow Gate Universal Swing Gate, U Gate Adjustable Safety Gate and Yellow Gate XL. Color finish is Yellow. OSHA approved. Dimensions vary per model. 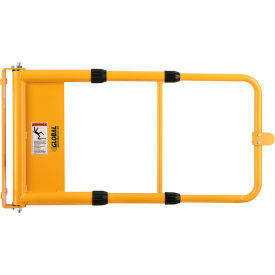 Little Giant® Safety Gates Are Used For Crowd Control At Factories, Workshops, Storage Areas And More. Safety gates are made with a powder coat finish for lasting durability and strength. Set screws secure at desired width. Adjustable Spring Safety Gates are made with a stainless steel tension spring that closes the gate automatically. Width is adjustable between 22-1/2 and 36 . 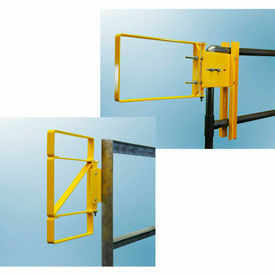 Hydraulic Arm Safety Gates use hydraulic pressure to smoothly close without slamming. Closing tension is adjustable. 15-31 adjustable width. Hardware not included. Gates meet OSHA standards. 1 Year Limited Warranty. FabEnCo Carbon Steel Self-Closing Safety Gates Securely Attach To Existing Fixtures To Provide Crowd Control, Parking Lot Security And More. FabEnCo Carbon Steel Self-Closing Safety Gates are durably constructed with carbon steel for long lasting strength and dependability. Installs easily without cutting, welding or drilling. Stainless steel spring automatically closes gate after passage is complete. 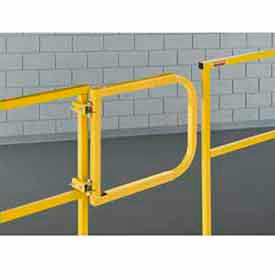 Positive Stop mechanism provides stop without handrail post contact. 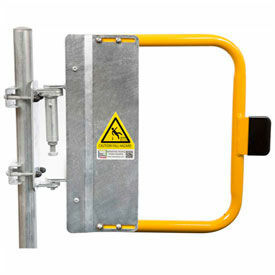 Available types include A Series, XL Series, and Z Series Self Closing Safety Gate. Available in Bolt-On and Clamp-On styles. Gate lengths range from 26 to 46-1/2 inches. Color finishes are Galvanized and Yellow Powder Coat. Dimensions vary per model. 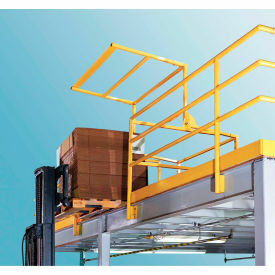 FabEnCo Mezzanine-Pivot Safety Gates Protect Employees In Elevated Mezzanine Loading Areas. FabEnCo Mezzanine-Pivot Safety Gates are made of galvanized carbon steel with powder coating finish to provide long lasting durability. Counter balanced gates ensure that one gate is always between employees and platform edge providing additional workplace safety. Available in single or double pallet widths, gates break down and assemble easily with basic tools. Measure the inside clear opening to correctly determine the proper gate size. Finish is Safety Yellow Powder Coat or Galvanized. Widths are 64" or 113". Height is 42". Meets or exceeds OSHA, IBC and ANSI Standards. Wildeck’s Laddergard™ safety swing gates are self-closing and meet OSHA 1910.23 safety requirements. They are constructed of strong structural steel that with stands the daily use and abuse that many other ladder gates can not provide. All Laddergard™ gates are painted with a durable 2-part polyurethane coating that is a bright safety yellow color for high visibility, even in low light conditions. They are available in two sizes that are adjustable to fit either 16" to 26" wide openings; or 27" to 40" wide openings. All mounting hardware is included and gates are easily installed to existing pipe rails up to 2 inches in diameter. Kee Safety Self-Closing Safety Gates Provide Safety and Hazard Protection for Internal and External Use. Kee Safety Self-Closing Safety Gates are made of galvanized steel to provide long lasting durability. Spring loaded gates automatically close behind the user. Kee Gate adjusts easily on site for precise alignment. U-bolts (included) enable the gate to be secured quickly to existing supporting structures and posts. Gate openings range from 15"-44 to 46-1/2" to 48". Lengths range from 18" - 48". Available colors are Gray and Safety Yellow. Complies with North American Standards. 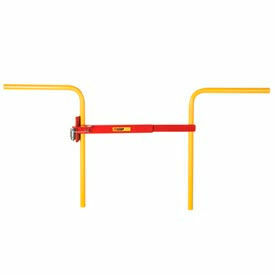 FabEnCo XL Series Carbon Steel Yellow Clamp-On Self-Closing Safety Gate, Fits Opening 22-24.5"